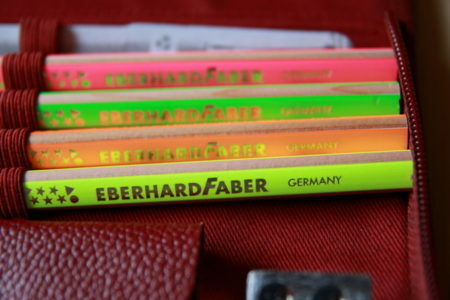 When I was in Germany in April 2010 I bought this Eberhard Faber pencil case at the Müller store in Volkach, Lower Franconia. Müller is a drug store chain with shops in Germany, Austria, Switzerland, Slovenia, Hungary, Croatia and other countries. The Müller shops I have seen so far had a nice selection of stationery. Keeping the size of the shop in Volkach in mind they had a rather big stationery section. All the common products and brand were stocked …those that you would find in most shops in Germany, i.e. mainly Staedtler, Faber-Castell and for mechanical pencils the common Japanese brands as well. You will also find some Lyra pencils, but don’t get your hopes up if you are looking for niche products. You will certainly find sharpeners, but if you are want a specific model not from Staedtler or Faber-Castell, but from Dux, M+S or Eisen you will be disappointed …but to be fair: not many stationery shops stock these brands anyway. One of the reasons why I bought this pencil case was to get it while it is still available. 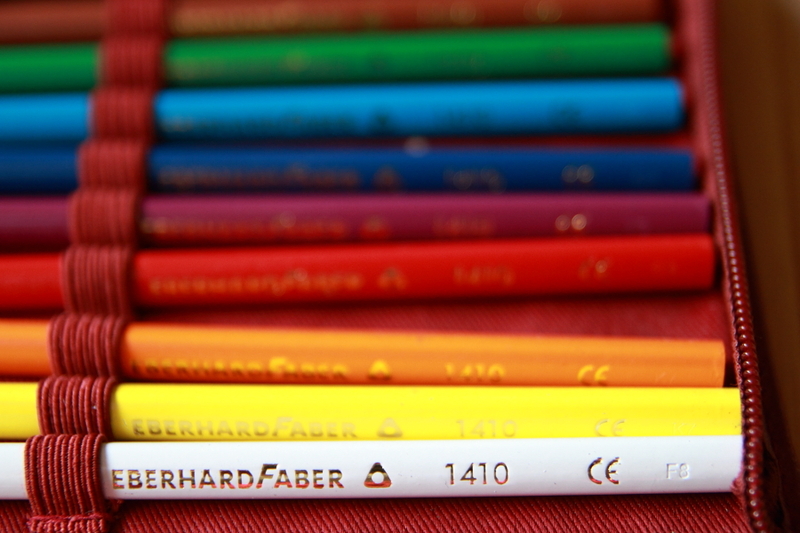 Eberhard Faber was an American brand, but was sold to Faber-Castell. Since the 1990s Sanford owns it and as far as I know Eberhard Faber products disappeared more or less completely in the USA. If this is not the case and Eberhard Faber articles are still available in the USA I would be grateful if you could let me know. Not uncommon in such a case: another company held the trademark for another geographic area, in this case Staedtler continued to use the Eberhard Faber name in Europe1. Recently Staedtler sold the Eberhard Faber trademark, which now belongs to Faber-Castell. 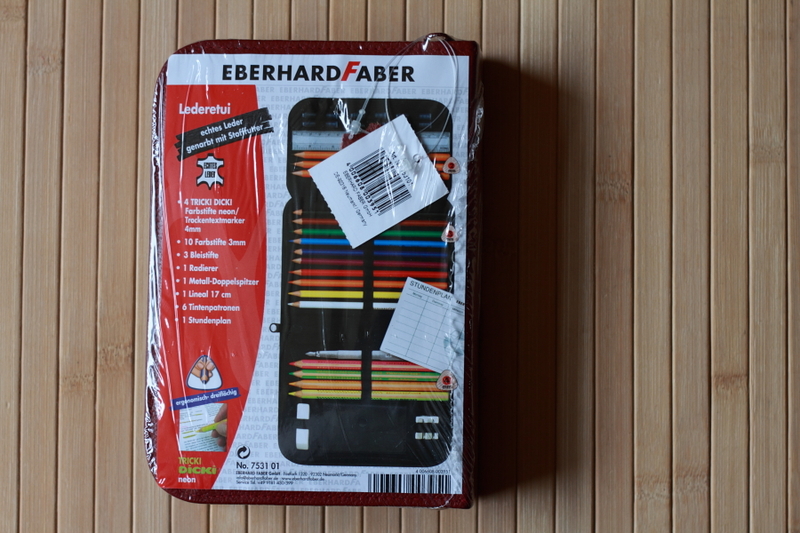 My understanding is that current Eberhard Faber products will not completely disappear, but will instead be sold under the Staedtler name in the future. Eberhard was the brother of Lothar von Faber, the great-great grandfather of Count Anton Wolfgang, the current CEO of Faber-Castell. Originally Eberhard managed the subsidiary in New York and later he established his own company under his own name (see page 8 of the 2 / 2007 issue of Faber-Castell topics). If you want to know more about the Eberhard Faber brand: page 5 of the 1/2010 issue of Faber-Castell topics has a great article about the history of the Eberhard Faber brand. Back to the pencil case. The pencil case was €14.99 ($19.90, £ 12.45) and is filled with 17 pencils (all of them triangular shaped), an eraser, a ruler, a sharpener, 6 ink cartridges and a timetable. 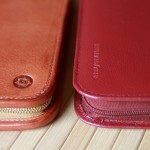 The material of the pencil case is real leather, but unfortunately the leather is rather thin. Four of the pencils are the Tricki Dicki highlighter pencils in neon colours: yellow, orange, green and red. The pencil case was available in three different colours: tan, black and maroon, the one I bought. Just for your information: In Germany maroon is usually referred to as “Bordeaux red”. Although possibly not the best choice of name for English speaking countries, these pencils work very well, but like all highlighter pencils they cover written or printed letters to some extent. They look very similar to the Staedtler textsurfer dry, so I assume the Tricki Dicki and the textsurfer dry might actually be the same pencil. The circles, stars and triangles printed on the Tricki Dicki pencils can also be found on Staedtler’s new learner’s pencil. I could not find a direct equivalent to the other colour pencils from the pencil case in Staedtler’s product range. The most similar pencil seems to be the Staedtler ergosoft, but unlike the ergosoft, the Eberhard Faber 1410 colour pencils do not have ABS coating. 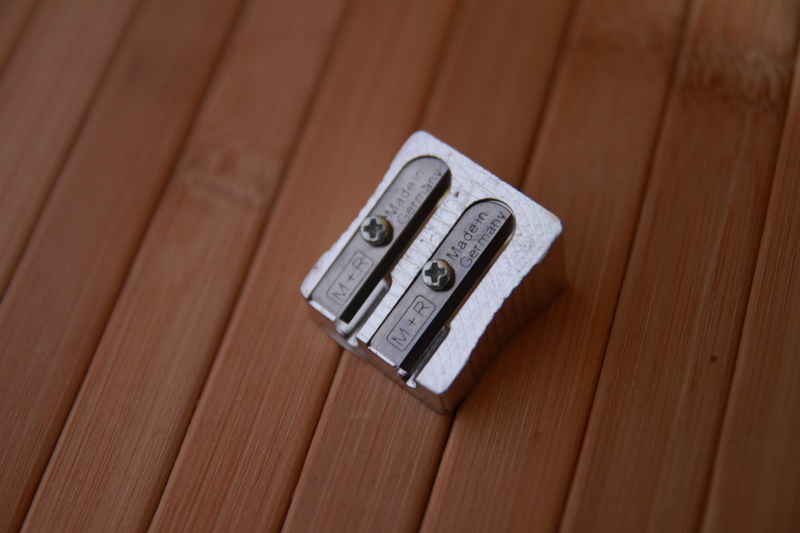 The sharpener that comes with the pencil case is the Möbius+Ruppert double hole magnesium sharpener 0211. The white eraser that you get does not have anything printed on it. The Eberhard Faber Lederetui is a tri-fold pencil case with the fold-out part containing a timetable on one side and the ruler, the ink cartridges and three 1210 pencils on the other side. I am not sure whether there is an equivalent pencil that is being sold under the Staedtler name. If there is one it might be the triangular Noris Club. The Eberhard Faber 1210 pencils are very nice indeed, rather dark and not scratchy. They do however look relatively boring and I have to admit that I am less of a fan of triangular pencils than most other people. The Eberhard Faber Lederetui is great value for money. You get quite a few pencil and a nice sharpener for your money. 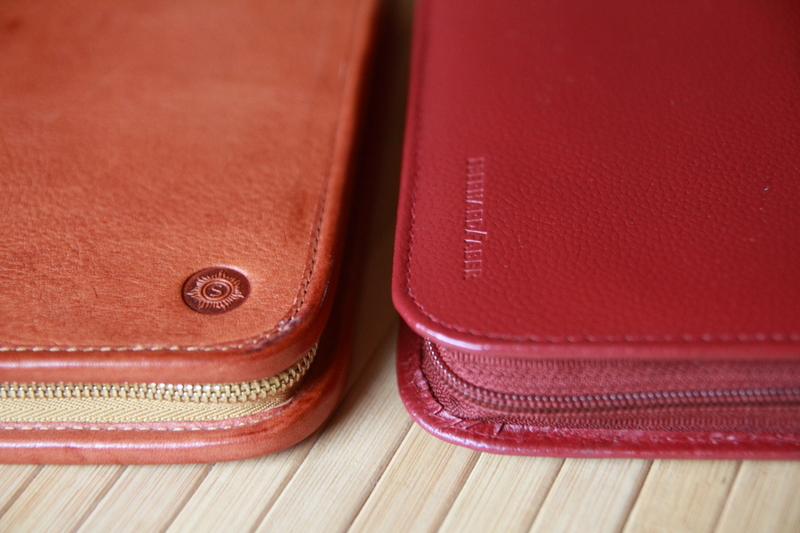 Compared to high-end pencil cases like the Sonnenleder Lasse it does however feel a bit flimsy and the leather, even though it is real leather, feels quite plasticy. 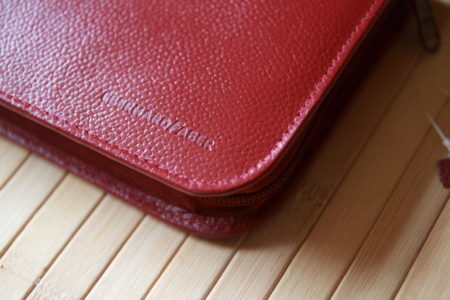 This pencil case is being sold to school children, therefore the thin leather makes me wonder whether the pencil case will survive very long in the real world… Nevertheless I am sure it will last for a long time if you look after it. I’ve never seen the red one, only the kip or tan colored version, and without that little inner snap pocket. The tan version was sold at 5 Euros at Kaufhof for a time, probably in liquidation. It looks very nice in red. Thank you for your comment. I will have a look whether I can find the tan version when I am in Germany again. € 5 sounds like a fantastic price. 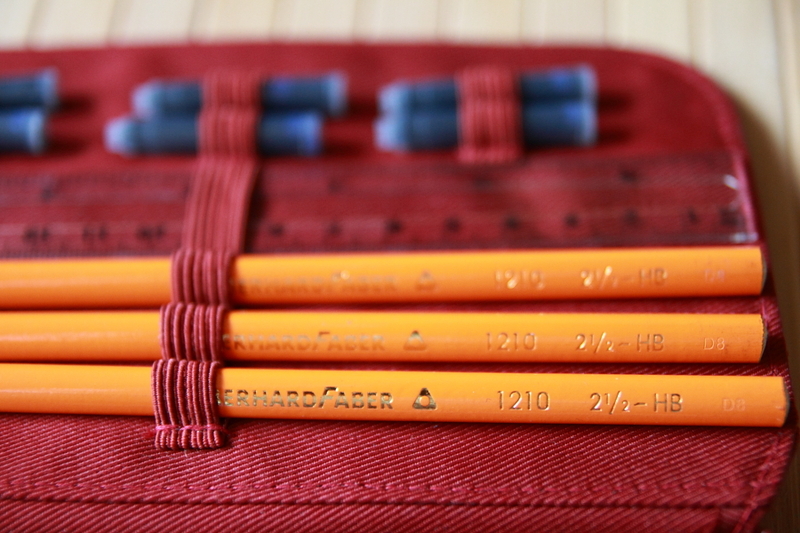 About the rights: I assume that Staedtler bought them when Sanford bought Eberhard Faber. Many if not all Eberhard Faber products seem to have been relabelled Staedtler products with minor modifications, so I assume Staedtler will do what they did with FIMO: keep selling the same products but under the Staedtler name. Faber-Castell on the other hand is also happy: they can try to serve different markets with the different brands, e.g. Eberhard Faber for children, Faber-Castell for products at the higher end of the market. Unfortunately Eberhard Faber’s website has not been relaunched yet, otherwise we would know whether they introduce completely new products for the Eberhard Faber name or whether they move some of their existing products to the new brand. The presentation is appealing – it seems to be a nice set, especially for the price, though the ink cartridges are in need of a pen. I believe the Eberhard Faber name is still in use by Sanford in the US. See here for example. Thanks, Memm. Let’s see what Faber-Castell does with this. 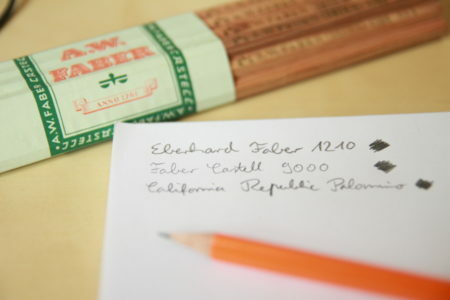 It would be nice if they could re-introduce some of the classic, pre-war Eberhard-Faber European pencils. On this side in the USA, we are all anxiously awaiting the re-introduction of the Blackwing 602 by Cal Cedar, who bought the rights from Sanford. There is another press release that interviews Axel Marx of Staedtler. It reveals that the trademark rights are a complicated issue, with Staedtler having had both geographical and product line limitations in the use of the name. And with the world wide web, the situation gets very confusing for consumers. 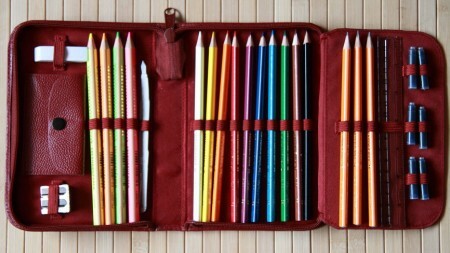 I’m glad to have a few Staedtler/EF pencils tucked away, though nothing as nice as this pencil case. This case is absolutely regal… I’d love to have it. Repurpose it for pens when the pencils have gone…. I remember those. They were almost mandantory in my good old (scool)days. I think I have worn out three of these as a schoolboy. Which makes the average life span about three years. What puzzled me back then – and still puzzles me now is the cardboard fountain pen – and the pelikan style cartridges. This pencil case reminds me of the ones I used to have in grade school – I can’t remember what brand it was, but I remember my grandma bringing me a new one from Germany every year or two. Ah, such nostalgia. There’s only one problem with German pencil cases: they are too small for American pencil with erasers, especially the new Palomino Blackwing, which is a very long pencil. The Blackwing 602 and the Palomino BW do not fit if they are unsharpened, but they do fit in the Sonnenleder pencil case Berit, which is approximately one inch longer than a Japanese Muji pencil case. 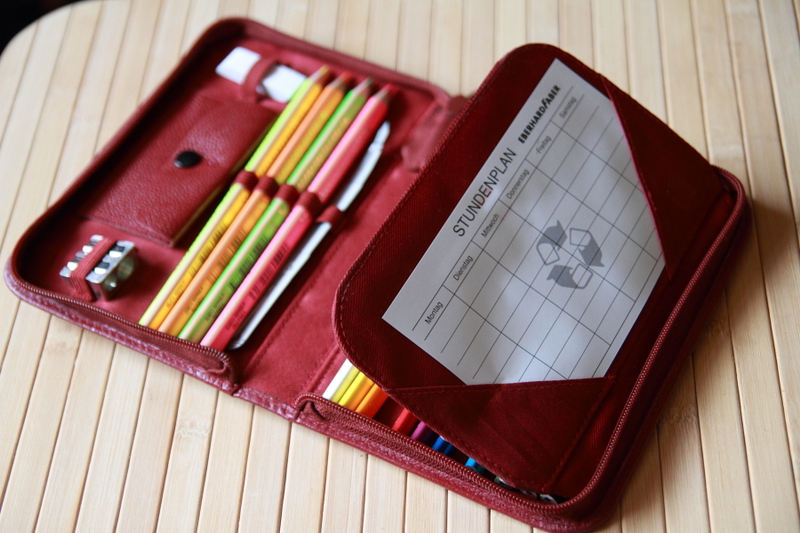 Most pencils will fit in this Eberhard Faber Lederetui though, including an unsharpened Tombow Mono 100. Most American pencils I tried will fit either easily (e.g. Eagle Standard) or just (e.g. Ticonderoga with Eraser). The Blackwing is the only exception I know. Wow—the Palomino BW fits in the Berit? Amazing. I have the Sonnenleder Maeppchen, which I adore, but the fit for pencils with erasers is tight when at all possible. Forget about the Palomino BW unsharpened! So, I keep this Maeppchen as my German writing case, full of superb Faber Castell and Staedtler pencils, a German metric ruler, Rotring compass, Staedtler eraser, and a gorgeous E. Roland leadholder from the former East Germany. I feel really smart when I carry this Maeppchen! German writing equipment is so full of character and beauty. Does anyone know where I can purchase this beautiful set online? I have looked and looked, but can’t find any info. Any colour would be fine with me.. Thanks in advance! I would love to own one of these pencil cases but have been unable to find any UK suppliers. Does anyone have the address of a website please? PS – I have been nuts about pens, pencils, paper and pencil cases for over 40 years and am unlikely to change now…..
A friend of mine used to bring me these from Germany. I have one that isn’t leather, it’s a printed nylon type material. I’ve had it for years and still use it to carry pencils, however it is indeed too small for brand new American sized wooden pencils. the little flap where the schedule card was started coming off, so I just took it out. The sharpener is of good quality, I like when things are made of all metal. the pencils in that picture you have seem round, but mine were all the hexagonal type. the pens and markers it had are long gone or dried out, but I still have at least one of each color pencil from various sets. most of the sets didn’t have all the stuff here.. if I remember correctly, one had fine tip felt markers of different colors, color pencils of about the same colors, one HB graphite pencil, sharpener, maybe a little eraser, some kind of liquid ink pen with the very thin metal tip with little holes in it, and a ruler/right angle. another set had those ink refills but I didn’t know what they were for so they’re.. somewhere. maybe in my big box of writing utensils. Thank you for your comments. Unfortunately I don’t know any shop that sells them in the UK. I assume these pencil cases from Eberhard Faber will disappear from the market soon or will be sold under another name, since Staedtler sold the trademark rights for Eberhard Faber to Faber-Castell. Adair and Da, thanks for sharing your pencil case experience. I think it is quite common, especially for plastic cases, that the flap with the schedule card, will come off after long use. The pencil cases of this shape are, in my experience, more common for young children. Older children and teenagers tend to use pencil cases more similar to the Sonnenleder case Berit. Any idea where I could buy this or a similar pencil case please? I am based in Scotland, UK. Catherine, unfortunately I don’t know where you can get these in the UK. I haven’t seen these for a while, so I assume Faber-Castell stopped making them when they took over the Eberhard Faber brand.